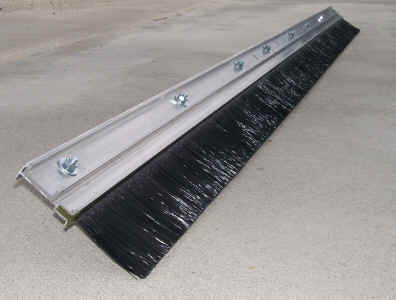 1) Our popular aluminum head finishing broom available in a selection of 8' and 10' lengths. 8' & 10' Broom heads are structurally reinforced the length of the broom to reduce flex. Our aluminum cement finishing broom with a 1-1/2 x 1/2 x 1/8" aluminum channel securely fastened along the length of and within the web of the broom head (see profile.) Standard bracket mounting holes provided on 4" and 24" centers. Ideal for use with Broom/Float Adapter Bar and RopeRunner™ Rope Broom Accessory. 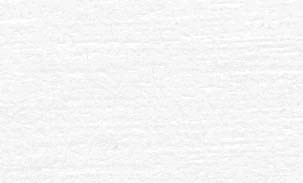 Available in soft black poly, xtra soft white poly and reinforced natural hair fiber. 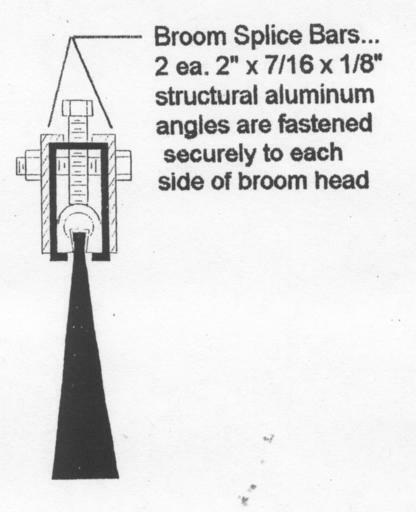 48", 60" or 72" brooms set in a 2" x 1" x 1/8" sturdy aluminum head. Order with factory pre-fitted with splice bars to join as many lengths together end-to-end as needed. 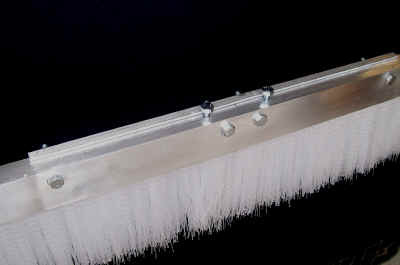 We suggest brooms 10' or longer be used in applications where an adequate system of support and suspension is available. Splice bars are of 2" x 7/16" x 1/8" aluminum angle, are 15" long and extend 7-1/2" from either side of the mating joint and on both sides of broom. 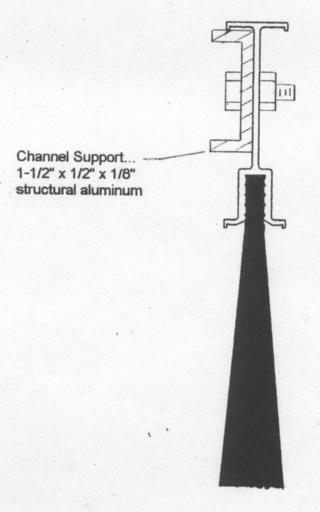 They are pre-fitted at the factory and require only bolt-together assembly. 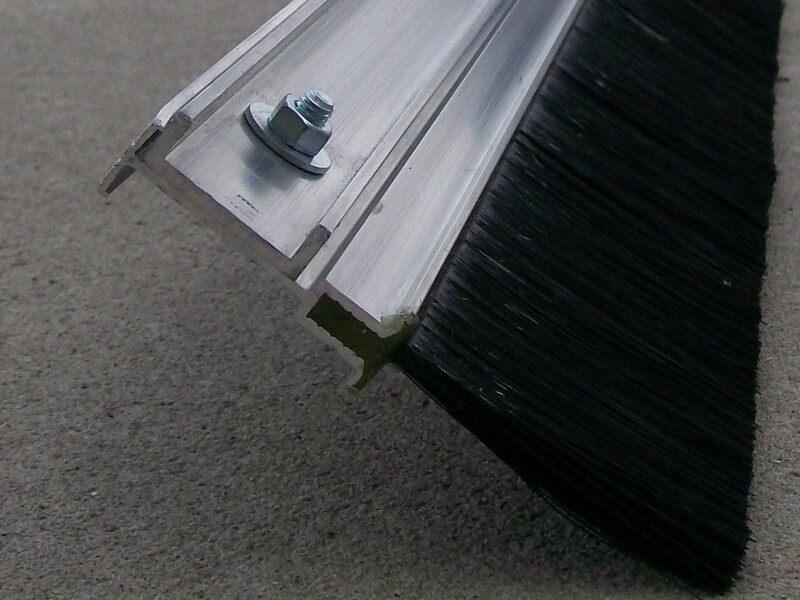 Unassembled broom segments in 4', 5' or 6' lengths with splice bars attached may be shipped UPS. Break down into segmented lengths for easy transport from job to job. *Support an assembled broom with two on more RopeRunner™ Rope Pull units to provide support and control broom angle control. 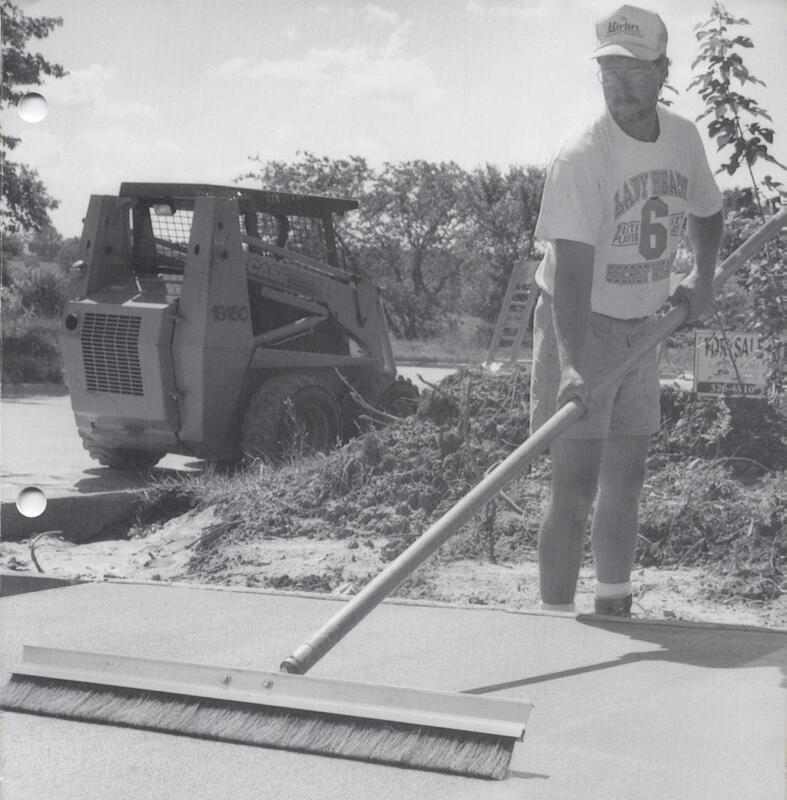 Pull behind a slipform paver for a drag broom finish. note: request a shorter trim length for a more aggressive brooming effect. Consult with factory for fiber samples.